The first pretzel was created in 610 A.D. by a monk in southern France or northern Italy. It was originally called a ‘pretiola’ and was renamed ‘pretzel’ later when the idea migrated to Germany and Austria. In 1861, pretzel twisting was the second highest-paying job in the Philadelphia region. Today, machines do the twisting, although at some artisan shops, tourists can still see it done the old-fashioned way. In the 18th century, German children would wear pretzel necklaces at the beginning of a new year for prosperity, health and good fortune. 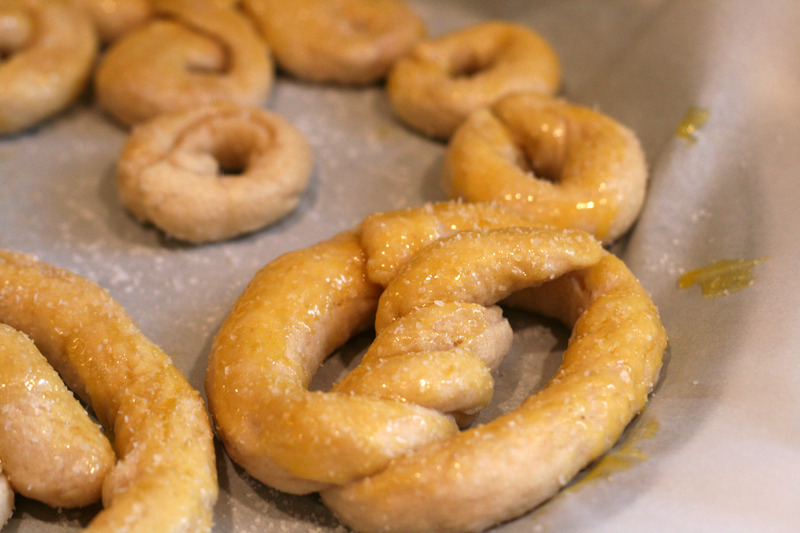 In the 17th century, pretzels were known as a marriage knot. During a wedding ceremony, a couple would wish upon a pretzel, break it (like a wishbone), and eat it to signify their oneness. It is speculated that the term, “tying the knot,” originated in Switzerland in 1614 during a wedding between two prominent families. 1785 John James Audubon was born. Ornithologist, naturalist and artist, known mainly for his paintings and sketches of North American birds. 1877 Minnesota held a state day of prayer to plead for an end to a 4 year plague of Rocky Mountain locusts. In southwestern Minnesota, locusts had been eating crops, trees, tobacco, fence posts, leather, dead animals, sheep’s wool – everything but the mortgage. Two days later a snowstorm moved through and the locusts were never seen again. No one knows what caused the locust plague, nor why the Rocky Mountain locust became extinct after the plague. 1962 ‘Mashed Potato Time’ by Dee Dee Sharp is #1 on the charts. 1986 Chernobyl nuclear plant in the Ukraine explodes. The worst nuclear disaster in history. In addition to the human toll, agriculture and livestock was contaminated by radiation in large areas of Europe for years to come. 2005 A herd of buffalo escaped from a farm and wandered around a Baltimore, Maryland suburb disrupting traffic, and shutting down several major highways. Police eventually herded them onto a nearby tennis court. 2006 Chicago banned the sale of foie gras. I gotta tell you – Pretzel Day got me my most longed-for Client! It’s true. I use food holidays to get my foot in the door. I know it sounds ridiculous, but Pretzel Day, Blueberry Cheesecake Day, Donut Day – these are the days that get me in the door.